The BBC have a great story about a new way of searching for the Higgs boson (or God particle) using sonic modelling; each layer of energy in a particle detector is represented by a note and their pitch is different depending on the amount of energy that is deposited in that layer. By analyzing the resulting sounds, it’s possible that physicists may be able to pick out the Higgs particle by “listening to the data”. You can hear a sample of what the Higgs might sound like on the BBC website. Richard Dobson, a composer involved with the project, says he is struck at how musical the products of the collisions sound – “We can hear clear structures in the sound, almost as if they had been composed. They seem to tell a little story all to themselves. They’re so dynamic and shifting all the time, it does sound like a lot of the music that you hear in contemporary composition”. Actually, that doesn’t surprise me . Most good music is pleasant to the ear because of internal symmetries. Given that our understanding of particle physics is founded on elegant mathematical symmetries, it’s not surprising that if you translate particle masses and energies into sound you get pleasing sounds! Best of all, this might offer another way to seach for brand new particles – I wonder what supersymmetric particles would sound like? Your should disable the “snap-shots” add-on software on this website, the one that keeps clicking and opening little preview windows. Its really annoying. They won’t find the Higgs boson in the way they are looking for it, mark my words. As i mentioned in my email to you on march 25th, the solution is staring them in the face and they can’t see it, or don’t want to see it. But however, a lot of money has been spent and there are Nobel prizes up for grabs, they must account for the spent money somehow. Hi John, I can’t make up my mind about those popups..sometimes I think they’re useful, sometimes they are indeed annoying. Re Higgs particle, bear in mind that the true aim of the experiments is not to ‘find it’, but to determine whether or not it exists in the expected energy/mass range..if this can be ruled out that is an important result. 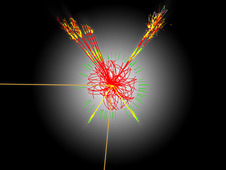 Even better, there is the possibility of detection of multiple ‘supersymmetric’ Higgs particles at larger masses which would open the door to supersymmetric world.. The snap-shot pop-ups are kind of like supersymmetric particles. They pop into existence for short periods of time, but everyone hates the fact that they are there and they can never measure one…LOL. If you like the snap-shots, keep it. More seriously, yes, it will all be very exciting to hear more new particles have been added to the current particle zoo. The zoo that just gets bigger and bigger with no end and no REAL result. There will be no super symmetry and no Higgs field, just a bigger zoo and more confusion. A bigger zoo would be fun – it’s been a while since we discovered any new particles! You’ve piqued my interest on this subject. Assuming you are either referring to a cosmic shift in consciousness that will alter one’s perception of matter (such as was predicted by the Mayans……commonly mistaken for a physical end to the world – 2012); or perhaps more a Buddhist philosophy or “science of the mind” (as HH describes it) that transforms how one experiences reality. Or maybe you’re on to something much more subtle than I can comprehend. In my first comment on this blog post, i was not referring to either Mayan calenders or Buddhist philosophy. Its just my personal opinion that the theory of the so called “Higgs field” is wrong and they won’t find it. They will only find more energy levels and another excuse to build a bigger machine when they are finished playing with the LHC. Today, because so much money has been spent on the LHC, no physicist can go out on a limb with a different theory that vastly differs from the “standard model”. But still, we know the standard model is wrong and it must be altered, just nobody is sure what to replace it with. Gravity is whats killing the standard model. The one force that makes the whole lot work, is NOT in the standard model, so they want to fudge it in somehow. So i proposed an alternate theory and i’m still formulating it. The answer my friend is staring you in the face.